Whisk all ingredients for dressing, and season with salt and pepper to taste. Set aside. Cut about 1/2 inch off the top and bottom of orange, enough to expose flesh. Stand orange up on cutting board. Using sharp knife, cut down and around orange, removing skin and pith, until no skin or pith remains. Hold orange in one hand over a bowl. With other hand, run a small sharp knife along right and left sides of individual sections, loosening and freeing them, one by one, from membranes. Continue until orange is completely sectioned. Discard membrane. Set sections aside. Repeat previous steps with second orange. Rinse fennel and pat dry. Cut about 1/4 inch off bottom of bulb. Cut bulb in half. Trim out and discard heart. Slice bulb into 1/4-inch slices. Heat olive oil over medium-high heat in a medium skillet. Once oil is hot, add fennel slices, add salt and pepper to taste, and cook for 2 to 4 minutes until caramelized and golden on both sides. Add oranges; then toss mixture with 2 teaspoons dressing. 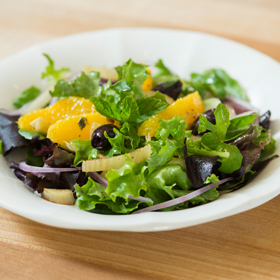 Toss salad greens with onion, olives (optional) and remaining dressing. Top salad with golden fennel and toss lightly to combine flavors. Garnish with more mint, if desired. Serving size: 1/4 of recipe. Amount per serving: 120 calories, 6g total fat (1g saturated fat), 17g carbohydrates, 2g protein, 5g dietary fiber, 100mg sodium.